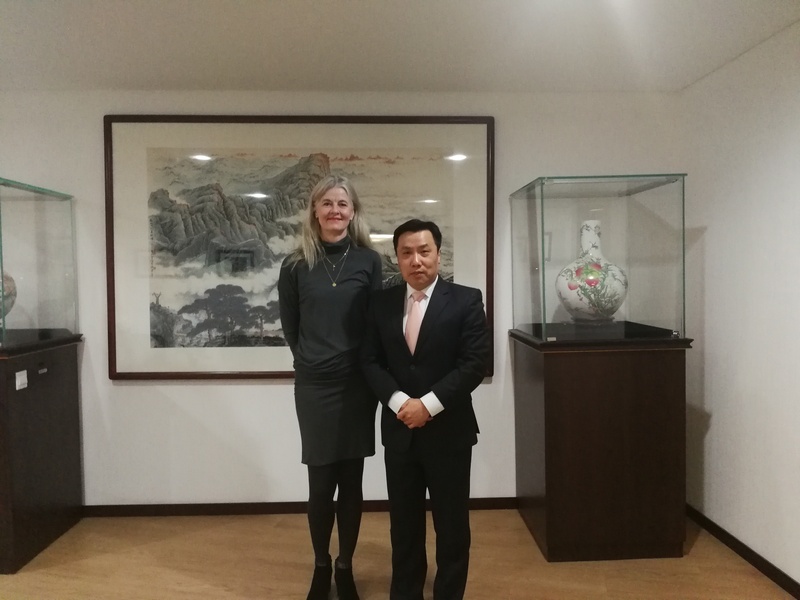 On March 12th, Chinese Ambassador to Iceland Jin Zhijian met with Katrin Olga Johannesdottir, Chairman of Iceland Chamber of Commerce. They exchanged views on strengthening exchanges and cooperation between the two sides. Jin briefed her on the latest situation of Sino-Icelandic economic and trade relations and China’s economy development, and stressed that with the signing of FTA between China and Iceland, economic and trade cooperation between the two countries has entered into a new stage. Bilateral trade volume has witnessed steady growth, and new development opportunities have emerged. The Embassy would like to strengthen communication with Iceland Chamber of Commerce, and further promote trade ties between the two sides. Johannesdottir thanked Jin for his introduction, expressing the appreciation of herself and many other local businessmen of China’s profound development achievements. She believes the huge market potential of China has created new development opportunities for Iceland. The Chamber of Commerce is willing to keep close contact with the Embassy, and work together to promote more practical cooperation between Chinese and Icelandic enterprises. There are about 300 members in the Iceland Chamber of Commerce, with the Chamber Board as the management body. Besides some industry branches, the Chamber operates 13 bilateral Chambers, responsible for developing international cooperation with the US, Britain, France, Germany and other respective countries and regions.